What do YOU love about Waterford? Summer’s here and there’s nowhere more beautiful place than Waterford when the sun shines. Show us what you love most! The beach, your back garden, your family, friends or neighbours, your pets, your favourite team? 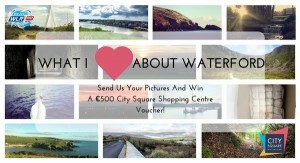 Send us in a picture of what you love about Waterford and you could win a €500 voucher for City Square Shopping Centre – your one stop shop for everything this Summer. Just send your photos to pics@wlrfm.com and we’ll pick the top 10 to go to a Facebook vote. The Winner is the picture with the most likes! A montage of all the pics will be shared on a wall here in City Square for a week after the winner is picked. All with thanks to WLR and City Square Shopping Centre, everything you need for Summer from sun protection to beachwear and everything in between.